Well, this book does exactly what it says on the tin. It is a workmanlike job, but for me it lacks the enthusiasm I look for in a great history book. There is little joy here in the interesting quirks and tidbits of life that make history so interesting, and consequently, it was a bit of a drag to get through it. So, dear reader, to save you having to persevere, I have summarised the history of Wales below. The first Celts came from continental Europe and brought with them the mysteries of iron working and the Brittonic language which was later to develop into Welsh and become such a point of pride in the Welsh nationalist movement. Fundamentally we don’t know very much about early Celtic society in Wales, and it is only when Ceasar arrives with the Roman army that records really begin. The Romans evidently had a rough time in Wales and it took several invasion attempts before they in any way felt secure. It is significant that they had to subdue the tribes by force; there was no introduction of the Pax Romana here. And, even once the Romans had built forts all over Wales and filled the country with their legions, there were still constant smaller uprisings. . As soon as the Romans left, the Roman roads, forts and social structures fell apart and the old tribal systems reasserted themselves. The main Roman legacy was the impact of Latin on the old Welsh Brittonic language. Another thing that the Romans left behind was embryonic Christianity which would come to rival the old druidic religion and spread like topsy during the Dark Ages. In the new, post-Roman order, it took a while for power structures to adjust and recalibrate. Eventually new Kingdoms, such as Gwynedd and Dyfed, appeared as warring families gained supremacy. Christianity spread with the help of Irish missionaries stirred up by the likes of St Patrick and bishops and abbots began to take over the role traditionally held by druids and bards. Interestingly, Welsh Bishops did not view themselves as subservient to Rome and practiced Christianity in the way that seemed most appropriate to them – often this involved adapting to previous pagan celebrations and rituals. This upset many people, including the Venerable Bede. Arguably, one of the key moments that helped to create the idea of Wales as a nation in its own right was the creation of Offa’s Dyke, essentially a manmade barrier creating a line between the Welsh tribes and the settled lands of Anglo-Saxon Mercia. It is only from this time that we hear the Welsh use of the word ‘Cymry’ or ‘comrades’ to describe themselves. In return, the Anglo-Saxons called them ‘Wallas’ meaning ‘foreigners’ from where we get the word ‘Welsh’. For years, Wales was formed of several smaller Kingdoms until the either brilliant or brutal (depending on who you ask) Gruffudd ap Llewelyn briefly managed to unite all of Wales into one Kingdom. The Norman King William had a drastic approach to Wales. He set up castles all along the border with hardened Norman Barons in charge. These fierce ‘Marcher Lords’ were different from other barons because the Westward boundaries of their lands were undefined – essentially they could have whatever they could hold on to. One of these original Marcher lords was called Hugh the Fat, which I mention only because it is mildly humorous and humour had been notably lacking through the book thus far. Over the coming centuries, despite a dogged resistance, the power of the Welsh princes was gradually eroded and the supremacy of the English King gradually conceded. King Edward followed the approach of the Romans and built EVEN MORE castles. I can only imagine that by this point there were very few hills in Wales that didn’t have a castle on them. The 15th century saw the final attempt by a Welshman to be Price of Wales. Owain Glyndwr was proclaimed a Prince of Wales on 16th September 1400. Henry IV responded brutally and, as well as putting down the revolt, imposed a series of punitive legislative measures. Welshmen were forbidden to own property or office, public gatherings were banned and he ordered that the bards be hunted down and restrained. Wales erupted and Glyndwr began building his empire. In 1404, he concluded an alliance against Henry with the French King, although this ultimately bore little fruit. Glyndwr had plans to create universities and turn Wales into a modern Kingdom, but, alas, his string of military victories came to an end and his territorial gains were reversed until he vanished in 1415. The country Owain Glyndwr left was in a sorry state, and even though Henry V was magnanimous in victory the country suffered from the destruction of its infrastructure during the wars. Then subsequent Henrys began to remove some of the most excessive anti-Welsh legislation then Henry VIII went a step further clarifying that Wales was an equal part of his Kingdom and inviting representatives from they newly formed Shires into his Parliament. From here it was but a step to the Acts of Union which brought relative peace to Wales. The reformation and advent of the printing press brought an end to the bardic tradition with the tradition of the eisteddfod dwindling away with the last one held in 1568. Interestingly there was still respect for the Welsh language and literary tradition, with several books being published in Welsh including the prayer book and eventually the Bible – even if it wasn’t permitted to use Welsh in formal situations or schooling. Cromwell wasn’t that popular in Wales. Most Welsh nobles had been on the losing side of the civil war. Gradually though, some puritan sects did take hold and these enclaves remained after the Restoration when otherwise many things reverted to their pre-Cromwellian state. The 18th century saw increasing Anglicisation and consequently also a growing antiquarian interest in the Welsh language, culture and history. It also saw the beginnings of industrialisation and the growth of religious dissent. Mining and iron working flourished. During this period towns like Cardiff grew from hosting 4000 people to 60,000 people. People streamed to the new towns and had to understand how this new urban economy worked. Steam trains began to traverse Welsh soil, but social legislation couldn’t keep up. There was no health and safety legislation passed or enforced in the mines and little attention paid to public health so illness was common and severe. But many people got rich and these new families began raising their own pleasure castles on the few un-castled hills left in Wales. Religious and political dissent grew following the American War of Independence and as a new culture developed in the newly formed towns, Wales became a hotbed of radicalism, Chartism and nascent trade unionism. The book describes several interesting industrial revolts including the Scotch Cattle movement, an uprising in Merthyr Tydfil and, finally the Children of Rebecca who dressed up as women with blackened faces and tore down the newly created tollgates on the roads, attacked cruel landlords and tried to destroy the unpopular workhouses. Once again, after years of calm, Wales was being viewed as one of the more turbulent areas of Great Britain. At this time concerted efforts we being made to increase literacy and numeracy among the general population. Largely led by religious groups, the education of the young became a battleground for their religious affiliation. But, sadly, there was a general acceptance that children should be taught in English. Slowly, in the 20th century, the energy that had driven the Chartist movements and trade union development transferred over into the newly formed Labour Party, cracking the previous dominance of the Liberal Party who were too closely aligned with the social and industrial elite. Then came Lloyd George who brought through a range of measures designed to improve life in Wales, for instance the creation of the Welsh Council of Agriculture, a Central Welsh School Board to oversee education and, crucially, the disestablishment of the Church of England in Wales. These and a host of other measures all served to emphasise the distinct identity of Wales and to foster a sense of nationalism. There was widespread support for the war in Wales and a disproportionately large number of Welshmen fought in comparison to English or Scottish men. Following the war, Wales slid into depression as first the coal and then the steel industries collapsed in the face of international competition. There was no investment or help for the beleaguered country and so the Welsh nationalist movement began to grow again with the formation of Plaid Cymru in 1925. Of chief importance to this movement was the preservation of the Welsh language, but soon nationalist rhetoric began to creep in. The introduction of the welfare state after the war went some way to bringing Wales back to its feet. In 1967 Welsh language act introduced – setting Welsh and English on an equal footing but by this stage only 20% of the population actually spoke Welsh. Through the 1970s and 1980s prosperity increased, the level of education rose and health improved. The nationalist cause was wobbly – at times Plaid began winning in the polls, but then in the 1979 referendum on a Welsh Assembly, the Welsh population strongly voted against. In 1997, by the slimmest of majorities, they voted ‘yes’ and the Welsh assembly was created. It is there that the book ends though, of course, Wales carries on. 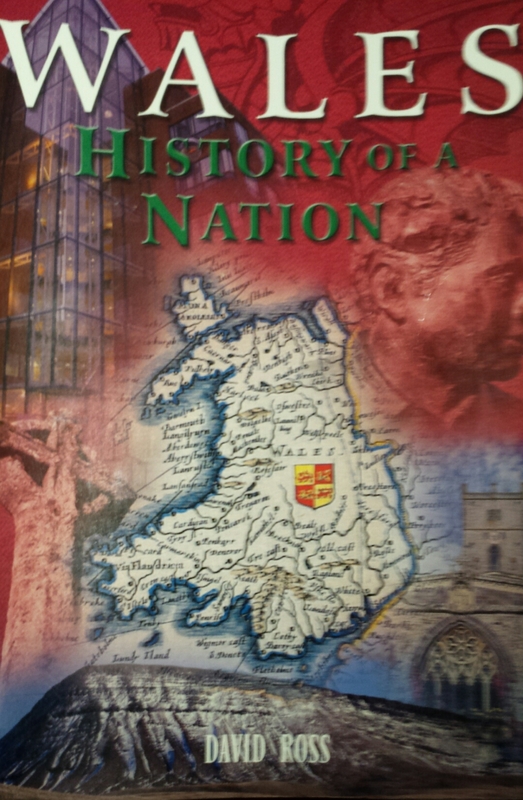 Tags: bards, book, book review, books, castles, History, Wales, War, Welsh. Bookmark the permalink. And they built you a lovely wall along the bottom of the country.